EDMI showcased its market-leading smart metering solutions at the Indonesian Electricity Exhibition (23rd to 25th October) in Surabaya. The key South-East Asia Conference rounded out a busy October for EDMI, which also presented at European Utility week, marking EDMI’s reputation as an international player. Guests not only experienced EDMI’s first Indonesian launch of a new corporate look, but also took a closer look at EDMI’s internationally popular range of pre-payment and three-phase meters, the powerful Genius and Atlas metering platforms and the advanced GSM/GPRS EWM 100 modem. EDMI’s Indonesian Sales and Marketing Director, Ratu Febriana Erawaty (Aie), was also pleased to welcome delegates from Indonesian government-owned PT PLN (Persero). “We have had some mutually beneficial discussions about our robust Mk7B and prepayment meters,” she said, “And, of course, EDMI and PLN are both positive about EDMI’s Indonesian factory, set to open in 2014. 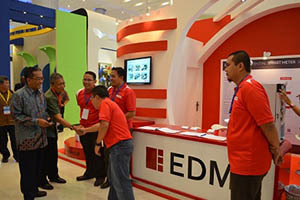 EDMI and delegates rated the stand at the Surabaya conferences a great success. EDMI is confident that the opportunities, realised, will open up new business in the region.